This form is a subordination, attornment and non-disturbance agreement (commonly referred to as SNDA) drafted for Wachovia Bank, which merged with Wells Fargo & Company effective at the beginning of 2009. 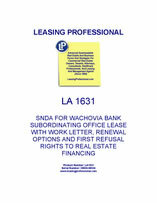 Wachovia is the lender that made the real estate loan on the property containing the tenant's premises. The document subordinates the tenant’s lease to the real estate financing. It further provides that the tenant's possession of the premises will not be disturbed if the landlord defaults under the financing, so long as the tenant continues to pay rent and otherwise perform under the lease. This SNDA also contains numerous pro-lender provisions in the event the lender forecloses on the property. In such a case, among other things, the lender will not be liable for any act or omission of any prior landlord. Likewise, the lender will not be bound by any amendment or modification of the lease made after the date of the SNDA without the bank's written consent, or be liable with respect to any representations or warranties made by the landlord concerning the use, compliance with zoning, landlord’s title, landlord’s authority, habitability or fitness for purpose or commercial suitability or hazardous wastes, hazardous substances, toxic materials or similar matters relating to the environmental condition of the property. THIS SUBORDINATION, NON-DISTURBANCE AND ATTORNMENT AGREEMENT (this “Agreement”) is made and entered into as of ___________ , 20__, by and among COMMERCIAL TENANT, LLC, a __________ limited liability company ("Tenant”), whose address is ___________________________; COMMERCIAL LANDLORD, L.P., a __________ limited partnership ("Borrower"), whose address is ________________________; and WACHOVIA BANK, NATIONAL ASSOCIATION, a national banking association ("Lender"), whose address is ___________________________________. Lender has made or may hereafter make a loan or loans to Borrower, which loan or loans are (or will be) secured by a Deed of Trust (defined below) covering all of that certain property described in Exhibit A attached hereto and made a part hereof for all purposes, together with all improvements located thereon (the "Property"). Tenant is the owner of a leasehold estate covering the premises (referred to herein as the “Premises”) located on the Property, which leasehold estate was created under that certain Lease Agreement (the "Lease Agreement") dated _____, 20__, between Borrower and Tenant. In addition, Borrower and Tenant have entered into that certain Work Letter Agreement (the "Work Letter Agreement") dated as of _____, 20__, governing the obligations of Borrower and Tenant with respect to the preparation of the Premises for Tenant’s occupancy. The Lease Agreement, the Work Letter Agreement, and all renewals, extensions and modifications thereof are hereinafter collectively called the "Lease". Borrower has executed or will execute a Deed of Trust and Security Agreement (with Assignment of Rents) (the “Deed of Trust”) and any and all papers now or hereafter governing, evidencing, guaranteeing or securing or otherwise relating to all or any part of the Borrower’s indebtedness to Lender (collectively, as may be amended from time to time, the "Security Instruments") covering the Property for the benefit of Lender as security for Borrower’s indebtedness to Lender, which indebtedness is or will be evidenced by one or more promissory notes by and between Borrower and Lender. As a condition to its making the loans now or hereafter evidenced or secured by the Deed of Trust (the “Loans”), Lender has required that Tenant acknowledge that Tenant’s leasehold interest in the Premises is subordinate to all liens and security interests securing payment of the Loans and to subordinate such leasehold interest to the liens and security interests securing payment of the Loans to the extent they are not already subordinate. Tenant is willing to acknowledge such subordination and further subordinate its leasehold interest; provided, however, that as a condition to acknowledging such subordination and further subordinating its leasehold interest in and to the Premises to all liens and security interests securing payment of the Loans, Tenant has required that Tenant’s right of possession to the Premises shall not be disturbed by Lender or any third party in the exercise of any of Lender’s rights under the Deed of Trust or any other security instrument securing payment of the indebtedness secured by the Deed of Trust, which protection Lender is willing to grant on the terms and conditions contained herein in order to induce Tenant to acknowledge its subordination and further subordinate the Lease to the Deed of Trust and all liens and security interests securing payment of the Loans. 1. Lease Subordinate to Deed of Trust. Tenant covenants and agrees with Lender that the Lease and all of Tenant’s right, title and interest in and to the Premises and any lease hereafter executed by Tenant covering any part of the Property is and shall be subject, subordinate and inferior to (a) the Deed of Trust and all liens and security interests securing payment of the Loans and all other security instruments securing payment of any indebtedness of Borrower to Lender now or hereafter created which cover or affect any part of the Property, and all renewals, extensions, substitutions, replacements, consolidations and increases in amount of the indebtedness secured by the Deed of Trust or any related loan papers, and to (b) all right, title and interest of Lender in the Property created by the Deed of Trust or any other security instrument held by Lender in the same manner and to the same extent as if the Lease had been executed subsequent to the execution, delivery, and recordation of such Deed of Trust and related loan papers. Borrower and Tenant hereby expressly subordinate to the Deed of Trust any and all options to purchase the Property contained in the Lease or in any modification or amendment to the Lease, and further acknowledge that any such option or right of first refusal pursuant to the Lease to acquire all or any portion of the Property shall not be applicable to or effective after Lender’s acquisition of the Property by foreclosure or otherwise. 2. Non-Disturbance. Lender covenants and agrees with Tenant, for Lender and its successors and assigns, that so long as Tenant is not then in default under the Lease (or beyond any grace period), Lender shall not disturb Tenant’s right of possession to the Premises in the event that Lender or Lender’s successors or assigns acquire title to all or any part of the Premises pursuant to the exercise of any remedy provided for in the Security Instruments, nor shall Tenant be named as a party defendant to any action to foreclose the liens and security interests securing payment of the Loans. (f) liable with respect to any representations, warranties or indemnities from Borrower, whether pursuant to the Lease or otherwise, respecting use, compliance with zoning, landlord’s title, landlord’s authority, habitability or fitness for purpose or commercial suitability or hazardous wastes, hazardous substances, toxic materials or similar phraseology relating to the environmental condition of the Property or any part thereof. In the event Lender shall acquire title to the Property, Tenant agrees to look solely to Lender’s interest in the Premises and rent and income derived therefrom for the recovery of any judgment against Lender, it being agreed that Lender shall have no obligation nor incur any liability beyond Lender’s then equity interest, if any, in the Premises, for payment and discharge of any obligations imposed upon Lender hereunder or under the Lease, and Lender is hereby released and relieved of any other obligations hereunder and under the Lease, and, in such event, Lender’s liability shall be limited as set forth herein.